People often say: “That was the moment I lost my innocence.” Can it happen to entire countries too? Some would say, yes, it can, and that it happened to both America and Britain in the 1960s. For America, it was the assassination of John F. Kennedy. For Britain, it was the trial of Ian Brady and Myra Hindley. The two events overturned the idea that life had returned to normal after the Second World War. The world might have looked more and more prosperous, with shiny material possessions and an end to hunger and want, but the assassination and the murder trial proved that evil and horror still existed and could still strike down the innocent. Even with hindsight it’s difficult to see how Kennedy could have been saved from Lee Harvey Oswald’s bullet. Perhaps that’s why so many conspiracy theories have grown up around Kennedy’s death. That a world-famous president could have been killed by a nobody offends our sense that important things should have important causes. They don’t. Ian Brady and Myra Hindley are more proof of that. They were two more nobodies and the biggest motives in their crimes seem to have been a desire to feel powerful and to escape boredom. That desire to feel powerful didn’t leave them when they were found guilty and sent to jail. For a long time they didn’t reveal where some of their victims had been buried on the moors near Manchester. They had the knowledge and refused to give it up, continuing the pain of the victims’ families. Even today, Keith Bennett hasn’t been found and his mother Winnie died without ever being able to give her son a decent burial. The word “decent” is very important. Death is often a horrible and ugly thing, whether it comes unexpectedly to the young or after a long illness and decline in old age. A funeral and the rituals that surround it return dignity and calm to the grieving friends and relatives. Funerals give us back a measure of control, allowing us to feel that purpose and meaning are not wiped out by the passing of someone who was dear to us. 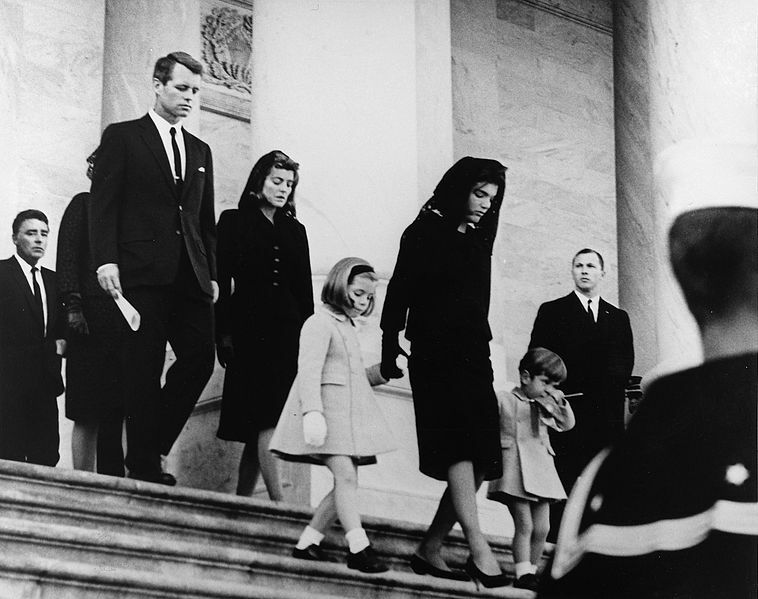 That’s why Kennedy’s state funeral was such an important event not just for his family and his widow Jackie but also for the country whose president he had been. After the randomness and horror of his assassination, the funeral was a re-assertion of humanity, a symbolic repudiation of evil and reminder that civilization was not helpless in the face of chaos. It was an opportunity to honour the dead president and acknowledge the significance and value of his life, but it was also an opportunity for the mourners to begin the journey back to some semblance of normality. The funeral industry provides more than a physical service, more than a way to take a dead body and place it in the ground or reduce it to ashes. It also provides a psychological service, bringing comfort to those who have lost a loved one and are struggling to find a secure footing in a world that seems to have lost meaning. That’s why the Moors Murderers were so cruel to deny the families of their victims a chance to bury their dead. Brady and Hindley also recognized the importance of a funeral, but in a twisted and corrupt way. Like so many evil people, they could not create, only destroy. Death destroys and tears down beautiful things, but a funeral is a creative act and an attempt to return the world to balance. Some of the world’s greatest art, music and architecture has been created to honour the dead. The funeral industry is part of that refusal to allow death to have the final word and to re-assert civilization in the face of chaos.